My longtime dream to visit the Maldives has been fulfilled this year. The Maldives undoubtedly is the land of paradise in the Indian Ocean. I had no idea I’ll be able to do many interesting things here within a concise time. During my three days solo trip I found romantic holiday gateway the Maldives is also an adventurous destination. In fact, who will not love the underwater adventure in turquoise waters? 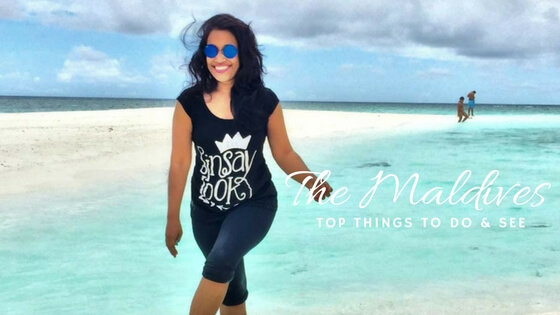 The listed below are some of my fave top things to do & see in the Maldives. I had such a wrong idea that the Maldives is only for luxury travelers and tourists. After traveling like a local I can say it is also possible to explore the Maldives on a budget. If you can not effort to have a luxurious dinner, you have an option to enjoy a barbequed fish party fun on any local island/beach at a minimal cost. There are many budgets to luxurious hotels and resorts to stay. So, now without a second thought, you should visit and enjoy your relaxing holidays in the Maldives. Hence you might like to check the following list of top things before a trip to the Maldives. Until visiting the Maldives, I never thought I’d be fall in love with the pristine turquoise water. The crystal blue water is the main attraction of the Maldives Island. Whether you stay in a luxurious water resort or a budget hotel, you’ll be not very far away from the fascinating turquoise water. I just loved my time in the Sandbank while playing with the warm crystal water. It takes less than one hour by boat from the Hulhumale Ferry Terminal to reach this small fun paradise in the Maldives. It’s like a tiny private island which surrounded by turquoise waters. Travelers here enjoy swimming, sunbathing, and photo shooting. Watch the following video to enjoy the ultimate fun in the Sandbank. 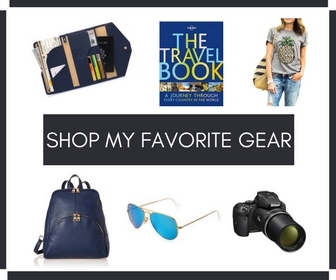 Do you love adventure? 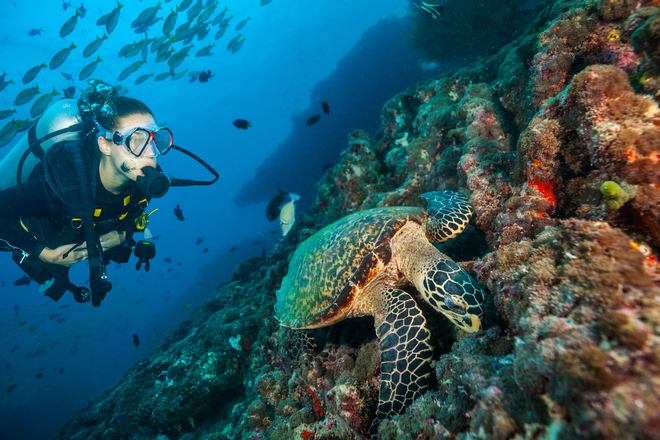 Then scuba diving is the must-do water sport for you in the Maldives. In fact, who will not love to dive in turquoise waters with Manta Rays, Whale Sharks, and Sea Turtles? Beautiful coral reefs, giant snappers, colorful many fishes also attract divers to dive in the Maldives. Banana Reef in the North Male Atoll is one of the popular diving sites. Addu Atoll is also worth to visit for diving. Many resorts and hotels in the South Alif Atoll and Gaafu Alif Atoll arrange diving tours for the tourist as well. I believe the real beauty of the Maldives lies under the turquoise water. I was amazed to explore the underwater beauty while snorkeling. You’ll definitely miss the actual fun and adventure without trying any water sport in the Maldives. During my boat trip, I enjoyed snorkeling while coming back from Himmafushi Island. But sadly could not record the video of snorkeling due to some technical issues with the GoPro device. There are many local islands in the Maldives and best to hop like a local. Take a public ferry ride to interact with locals, and this is also the cheapest but standard transport service in the Maldives. I explored Hulhumale, Villingili and Himmafushi Islands. It was nice to see the local lifestyle here. I found Villingili is a quiet Island. Many locals were playing footballs, and some were fishing on the Villingili Beach. I loved the mouthwatering taste of Maldivian food and sweet coconut water from the Himmafushi Island. There are also some local handicrafts shops in Himmafushi and best to buy souvenirs, fancy jewelry, and a bag. Why not explore some best and beautiful beaches in the Maldives? My relaxing moment in Hulhumale Beach was to walking and watching the sunrise. I loved the early morning quietness of this white sandy beach. One of the popular beaches among tourist is Fulhadhoo Beach in the Fulhadhoo Island. 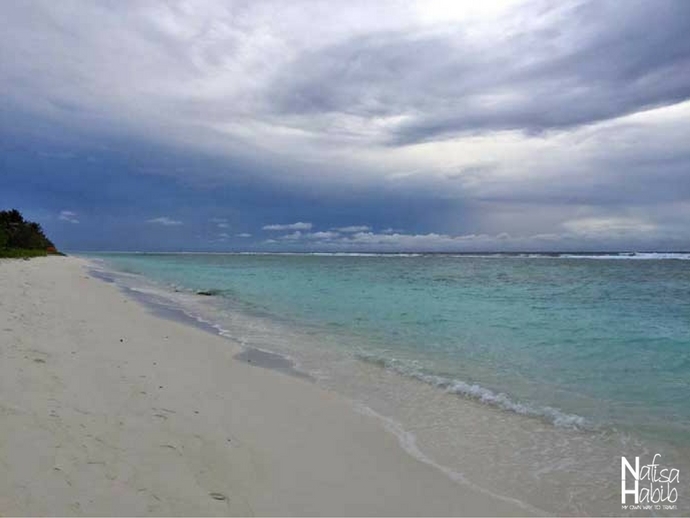 This beautiful local beach is under Southern Maalhosmadulhu Atoll. If you don’t love the quietness and looking for more fun and water sports activities, then best to explore Bikini and Water Sports Beach on the Maafushi Island. Jet Skiing is one of the fun water sports in turquoise waters of the Maldives. Now you can see there is no way to get bored when you’re in the Maldives. 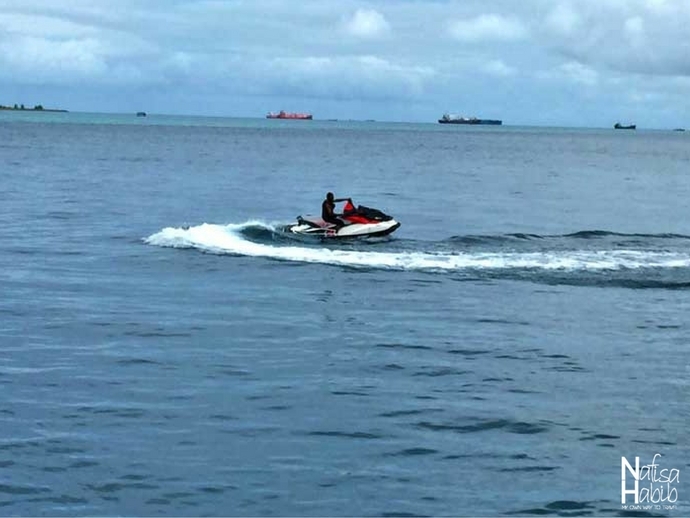 I loved the beauty of the Indian Ocean during my 30 minutes Jet Skiing in the Hulhumale Island. Some other mind-blowing water sports in the Maldives are surfing, parasailing, water skiing, and paddle boarding. 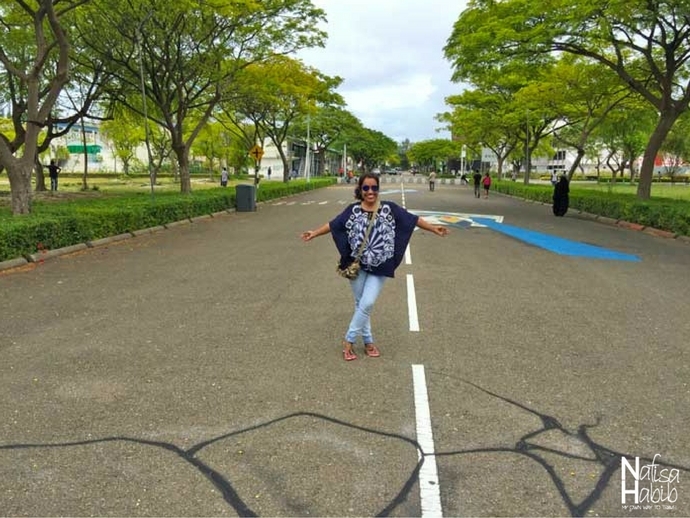 Biking can also be fun if you’re on the Hulhumale Island. Being alone I was able to go for a bike ride with the help of one local. You can say this is one of the perks of solo traveling. Hulhumale is the beautiful manmade island in the North Male Atoll. 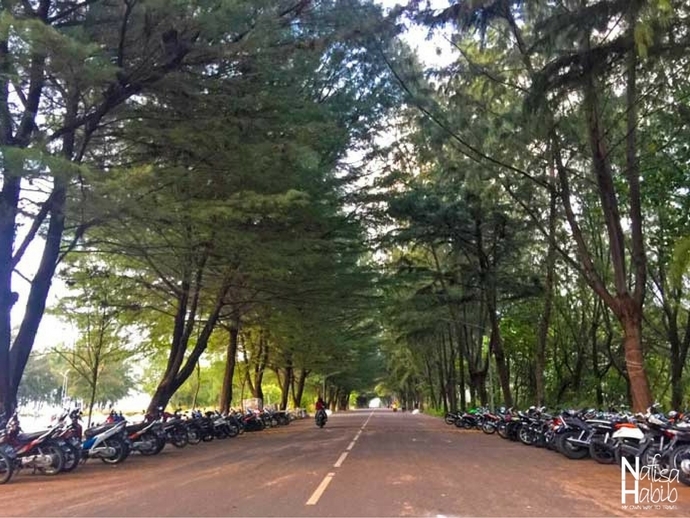 The road which leads to Hulhumale Ferry Terminal is too beautiful. Biking is interesting here but renting not allowed for tourists. You can hire a bike in the Addu Atoll to explore islands. Cycling is also cool in the Maldives and offered by many resorts for tourists. Yes, Maldives offers a lot more than your expectation. Have you visited yet? My first fave activities in the Maldives was swimming in turquoise waters at Sandbank, snorkeling and hopping local islands. Disclosure: This post sponsored by Accor Hotels Group. Here provided every information is my own and personal experiences during my tour in the Maldives. What is your favorite island in the Maldives? Share your ideas about top things to do & see in the Maldives. Scuba diving & snorkeling would be my reason go to the Maldives. Great to know that you can do the Maldives on a budget as well. Thank you, Anu for sharing your views! Yes, it’s possible to make it on budget. 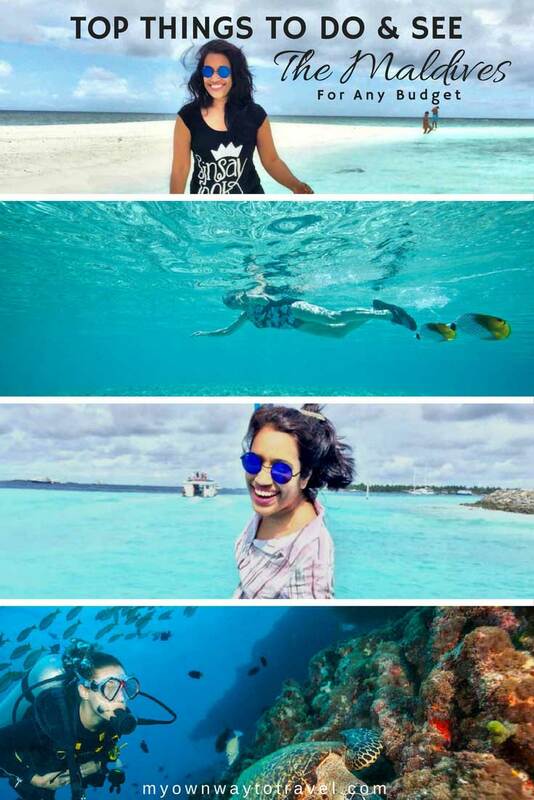 Love that you went as a solo traveler to the Maldives, usually people travel as couples and families or with friends. The Maldives is amazing, don’t think I’ve seen such lovely waters anywhere else in the world. You’ve captured all the best things to do there and that too at a budget, good work! Omg the scuba diving looks absolutely stunning! Great to know there are many activities in Maldives. Although honestly, I can just beach bum for a whole week.